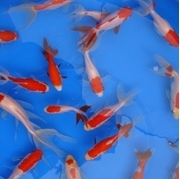 Fantail Sarasa Goldfish have short, robust bodies with double fan-shaped tails, and they are a brilliant red color with white patches. The fantail sarasa goldfish are slower swimming and more graceful than the single-tailed varieties, and they adjust with ease to pond life. If you're a new pond owner, fantail sarasa goldfish are a great way to add life to your pond without having to expend much care taking effort. 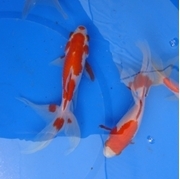 They are quite resilient and add bold splashes of beautiful color to your pond water. Fantail sarasa goldfish grow in proportion to their surroundings, and they can often survive year-round in a pond that has a proper aeration.